Throughout the world their are individuals with unquie abilities including telekinetic and clairvoyant powers. These powers are heavily sought after by a covert government agency who seeks to use them for their own means. These individuals are banded together in order to utilize their various talents to take down the agency for good. "Push" written by David Bourla and directed by Paul McGuigan is a disaster and despite all of it's super abilities is a bore to watch. The story itself is anti-climatic throughout, while the plot progression and character development are so disjointed and convoluded the viewer is never allowed to become absorbed in the film. McGuigan tries to wow the viewer with all of the various characters powers, but these powers are never utilized in a way that has any significance or impact. The editing throughout "Push" is choppy and does it's best to disrupt the viewer anytime they become remotely engaged. "Push" has a solid cast, but regardless of the actors talents, the characters are sullied by bad story telling and a overall un-engaging story. Chris Evans stars Nick Gant, a mover, who has not mastered his talents. He is introduced to Cassie Holmes played by Dakota Fanning who is a watcher. The two of them must work together to understand and stop Cassie's visions of the future. The chemistry between Fanning and Evans is desolate at best and as the two search the city of Japan for clues, the viewer quickly loses interest in the movie. Camilla Belle plays Kira Hudson who is a pusher and can force anybody to do whatever she wants. Belle is unconvincing as a powerful pusher and looks more like a scared little girl throughout "Push." Nick and Cassie locate Kira only to further complicate the story, which results in adding to the lack of interest. Every character introduced throughout "Push" poses another layer to the uninteresting plot. Djimon Hounsou plays another pusher Henry Carver, who is in charge of trying to round up all of the people with abilities. Hounsou is flat throughout the film and does little to elevate the unsavable film. Overall even with a decent cast, "Push" was doomed from the bad storytelling. "Push" tries desperately to create a story in which the viewer is absorbed in the characters, but the opposite ends up happening. The viewer has no connection to the characters and instead finds themselves counting the minutes till the film ends. "Push" moves at a very slow pace for only being 111 minute film and by the finale, you are truely thankful the punishment is over. 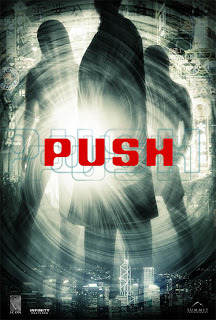 "Push" was an ambitious film that tried to rely heavily on it's abilities, however those abilities were drowned out by the weak plot and bad storytelling.